American tether technology satellite. The 53 kg satellite consisted of 2 end masses connected by a 4 km tether. NRO (the National Reconnaissance Office) provided funding for the TiPS project. Tether technology satellite for Naval Research Laboratory (NRL), USA. Launched 1996. AKA: ATEX;Tether Physics and Survivability. Status: Operational 1996. First Launch: 1996-05-12. Last Launch: 1998-10-03. Number: 3 . Gross mass: 54 kg (119 lb). The TiPS payload was placed in an 1019 x 1024 km x 63.4 deg orbit. 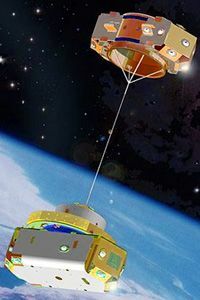 The Naval Research Laboratory's (NRL's) Naval Center for Space Technology designed, built and deployed the first in a series of small satellites to research the gravity-gradient dynamics and survivability of a tethered system in space, known as the Tether Physics and Survivability (TiPS) experiment. TiPS consisted of two end masses separated by a four-kilometer tether. The end masses were named Ralph and Norton after Ralph Kramden and Ed Norton from the 1950's Television Show "The Honeymooners". Ralph and Norton weigh 37.7 and 10.8 kilograms, respectively. TiPS was among the first successful tether deployments in space and was the first experiment designed for long duration. The TiPS tether, made by AlliedSignal, was in two layers. The outer layer was Spectra 1000 braid for strength, the core was acrylic yarn which puffed the other braid out to a 2 millimeter diameter and give it a larger cross section to improve its resistance to debris and small micrometeoroids. The tether could be severed by a space particle as small as 1-mm traveling at a relative velocity of 14 km/s (31,318 mph). Satellite laser ranging to TiPS was used to determine the precise orbit and attitude of the tethered system. This was the first time SLR data had been converted into attitude knowledge, in order to validate analytical models and simulations of a tethered system. TiPS SLR tracking support was discontinued 15 October 1997. Retroreflector arrays on both Ralph and Norton The TiPS RRA consisted of 18 retroreflectors were mounted on each exterior surface of both Ralph and Norton, for long-term passive monitoring of the tethered system. End-mass discrimination was accomplished by coating the retroreflectors of Ralph to reflect only the green wavelength, while the uncoated retroreflectors on Norton reflected both green and infrared wavelengths. Advanced Tether Experiment (ATEx) was the follow-on mission to TiPS and was launched in 1998. However the tether only deployed to 21 m when it snagged and the satellite was jettisoned from its STEX mother satellite and abandoned. ATEx carried a GPS receiver, which was to be used in precision orbit determination combined with satellite laser ranging. There were three ATEx mission objectives: 1) Demonstrate tether system stability and control, 2) demonstrate end-body attitude determination and control, 3) fly a tether designed for survivability. ATEx had the following instrumentation onboard: 1) GPS receivers; 2) Retroreflector arrays. Life: 6 months design, SLR support of TiPS was discontinued on September 30, 1997. ATEX deployment failed. Family: Medium earth orbit, Technology, Tether technology satellite. Country: USA. Launch Vehicles: Titan, Titan 4, Titan 403A, Taurus, ARPA Taurus. Launch Sites: Vandenberg, Vandenberg 576E, Vandenberg SLC4E. Agency: USN, NRO. Bibliography: 2, 279, 4, 6, 6987. 1996 May 12 - . 21:32 GMT - . Launch Site: Vandenberg. Launch Complex: Vandenberg SLC4E. LV Family: Titan. Launch Vehicle: Titan 403A. USA 123 - . Payload: TIPS Ralph. Mass: 54 kg (119 lb). Nation: USA. Agency: NRL, NRO. Class: Technology. Type: Tether technology satellite. Spacecraft: TIPS. USAF Sat Cat: 23936 . COSPAR: 1996-029E. Apogee: 1,032 km (641 mi). Perigee: 1,010 km (620 mi). Inclination: 63.40 deg. ??? . USA 124 - . Payload: TIPS Norton. Mass: 54 kg (119 lb). Nation: USA. Agency: NRL, NRO. Class: Technology. Type: Tether technology satellite. Spacecraft: TIPS. USAF Sat Cat: 23937 . COSPAR: 1996-029F. Apogee: 1,032 km (641 mi). Perigee: 1,010 km (620 mi). Inclination: 63.40 deg. 1998 October 3 - . 10:04 GMT - . Launch Site: Vandenberg. Launch Complex: Vandenberg 576E. LV Family: Taurus. Launch Vehicle: ARPA Taurus. USA 141 - . Payload: ATEX. Mass: 54 kg (119 lb). Nation: USA. Agency: NRL, NRO. Class: Technology. Type: Tether technology satellite. Spacecraft: TiPS. USAF Sat Cat: 25615 . COSPAR: 1998-055C. Apogee: 766 km (476 mi). Perigee: 750 km (466 mi). Inclination: 84.99 deg. Period: 99.90 min. NRO's ATeX (Advanced Tether eXperiment) reportedly failed on January 16. The ATeX lower end mass was meant to remain attached to the STEX parent spacecraft, but with only 21 m of tether deployed, it appeared the tether was so far off vertical that automatic safety systems jettisoned the base to protect the remainder of the STEX satellite. Thus, the upper and lower ATeX end masses were in orbit as one object connected by a 21 m tether, and designated USA 141 (1998-055C). The main STEX satellite was in orbit as a separate object, 1998-055A.